Investors & analysts must now reckon with politicisation of data at the very time they contend with deteriorating relationship between govt & RBI. Every nation’s economic output moves up or down along a long-term trend, fluctuating in accordance with seasonal patterns, business and financial cycles and random shocks. 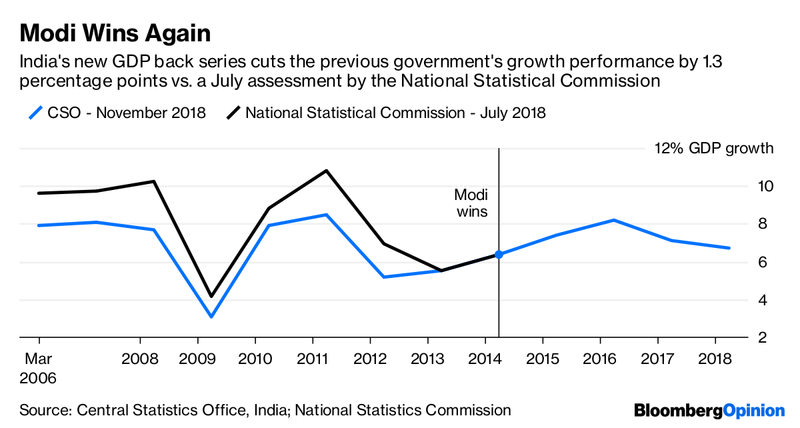 In addition to those variables, the growth of India’s GDP now depends crucially on which party was in power when the activity occurred – and under which party it was measured. Disagreeing about the future is for people on opposite sides of the Brexit debate, like Jacob Rees-Mogg and Bank of England Governor Mark Carney. New Delhi’s favorite pastime is quarreling about the past. That’s why, when statistics on historical GDP under a new base year were released Wednesday evening after almost four years without an official back series, the first thing analysts noticed was that Niti Aayog – a think tank set up by Prime Minister Narendra Modi – joined the statistics office in presenting the data and in defending the numbers later. Since the medium is the message, the figures became immediately political. With months to go before the next general election, the opposition Congress Party was predictably incensed that the new series downgraded its stewardship of the economy between fiscal 2006 and 2014. Two years of 10 per cent-plus growth chalked up against its name by a committee of the National Statistics Commission just months ago also got wiped out. The average 7.35 per cent GDP growth rate delivered by Modi in the last four years now trumps the 6.7 per cent pace of the preceding nine. And this is despite his overnight ban on 86 per cent of the currency in circulation and a tax change that was badly botched. Do the new official data pass the smell test? 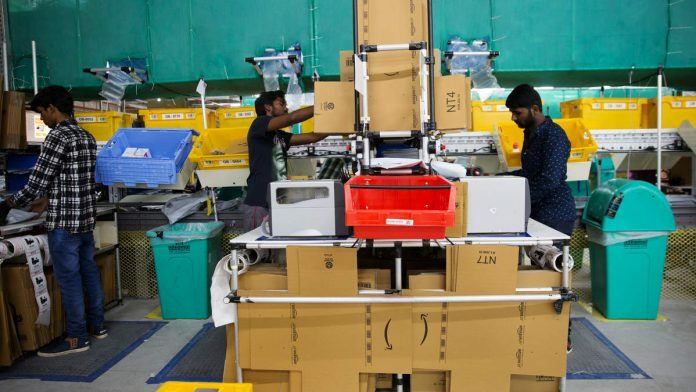 The annual earnings growth of 500 of India’s biggest companies averaged 11 per cent between 2006 and 2014, plunging to half that rate in the four years under Modi. That, in itself, is no reason to doubt the new national accounts. 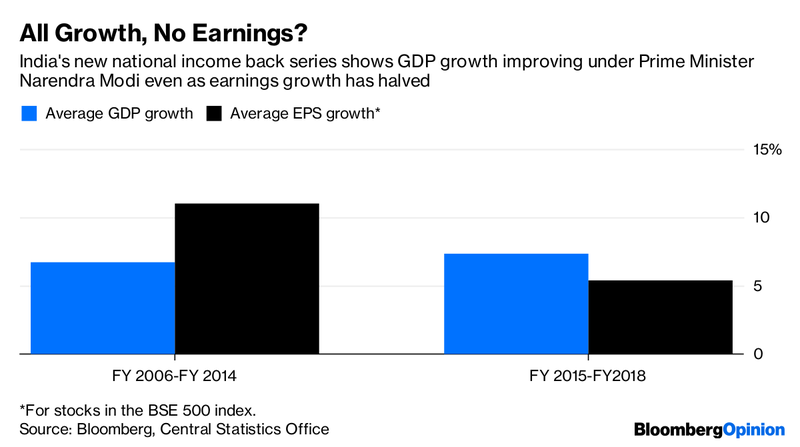 Using a different database, State Bank of India Chief Economist Soumya Kanti Ghosh concluded that GDP expansion in India is now coming less from earnings and more from rising employee costs. In other words, India is becoming what Marxist economists call a wage-led economy as opposed to a profit-dominated one. That interpretation isn’t wholly satisfactory. For one thing, India’s agrarian distress is not fake news. Private investment wouldn’t be so stubbornly lackluster if growth in recent years had been averaging higher than in the past. Balance sheets, which are weak for both corporate borrowers and lenders, would be getting repaired faster. There wouldn’t be a mad rush for the most menial government jobs. In fact, if you taper down the previous government’s economic performance, then Niti Aayog’s own condemnation of the pre-2011 period for its “untenable fiscal deficit and reckless expansion of commercial bank credit which was surely unsustainable” loses its sting. But because the overoptimism of that period isn’t an imaginary construct, the only way to show that India was growing too fast back then would be to extend the GDP series further than 2006. That’s when things get really complicated. Some of the databases the government is using for its improved GDP calculations didn’t exist back then. If these technical difficulties weren’t challenging enough, investors and analysts now must reckon with the politicization of data at the very time that they contend with a deteriorating relationship between the finance ministry and the central bank.